These days, when one thinks of the myriad consumable pleasures of Tuscany — wine, cheese, truffles, fresh tortellini — the notion of a hand-rolled cigar falls fairly far down the list. But the Toscano, or Tuscan cigar, is legendary among the Italians and the Swiss. 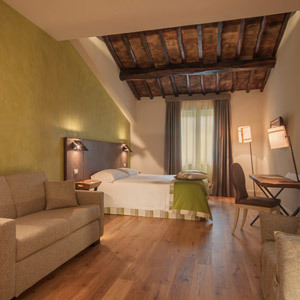 And if the thought of staying in a restored tobacco factory doesn’t strike you as romantic as, say, sleeping inside the buildings of an old winery, think again: with its hilltop position, original wood beams, intricately tiled ceilings, and rustic brick walls, Hotel La Tabaccaia is every bit as charming as any of the other boutique inns scattered across the rolling countryside. 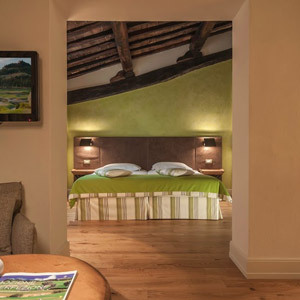 Located an hour from Florence, the 31-room La Tabaccaia (“The Tobacconist”) is just one part of the 800-year-old Castelfalfi estate, a sprawling property with restorations and modern developments — including a golf course and a swimming pool — still underway. But the hotel itself feels pleasantly intimate. 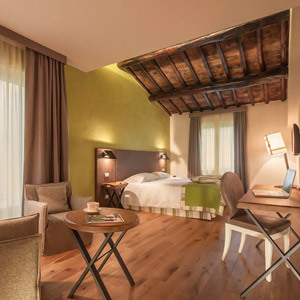 Apart from the vaulted wood-beam ceilings, guest rooms and suites look contemporary, decorated in a palette of olive and earth tones, with blonde hardwood floors and sleek bathrooms with rain showers. All but the most standard rooms feature separate living areas with sofas. But you’re more likely to spend time lounging around outside the room, given La Tabbaccaia's gloriously bucolic surroundings. After all, you’re in Tuscany for the wine and olive oil, right? The estate produces both, and sources fresh produce and meat from nearby farms to create the seasonal menus at a pair of restaurants. 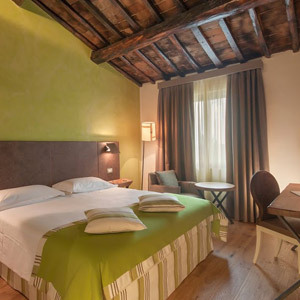 The trattoria Il Rosmarino is more suited to leisurely lunches, fabulous-Italian style, and wine tastings, while the newer bistro La Rocca di Castelfalfi is a destination in itself. It’s located in the estate’s castello, a 14th-century stone and wood castle with a panoramic terrace looking out over the rural landscape. You can also stop in to take a cooking class, or for a glass of Chianti, or three as the sun sets over the fields. You might even feel inspired to light up a Toscana — when in Tuscany, after all.